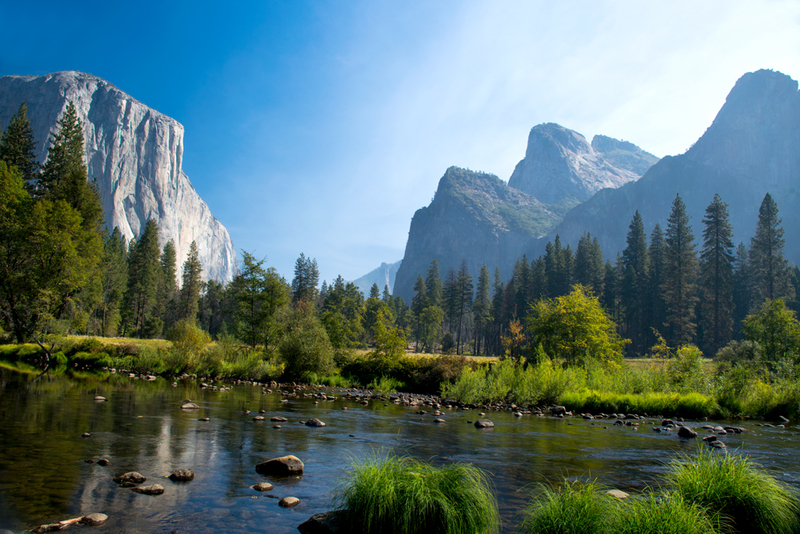 Yosemite National Park, in the California Sierras, is a rugged glacial valley with outstanding views of its major features: El Capitan, Half Dome, Bridal and Yosemite Falls and much more. The photos below are just a few of those I took - along with some commentary where necessary. 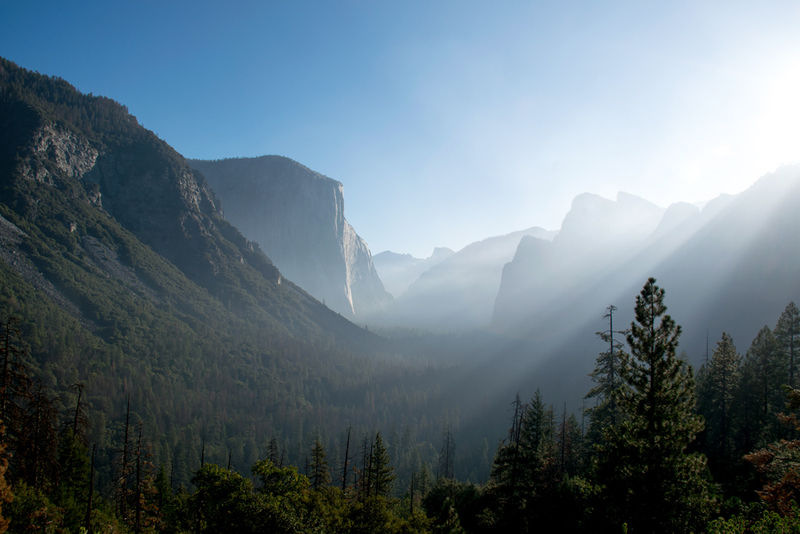 While in Yosemite, there was were two feature I did not plan on - smoke and the lack of Cellphone/wifi service. There were numerous small fires (planned and unplanned) in the mountains around the park, and the smoke from these fires would settle in the valley over night. As the day warmed up, the smoke would rise, making the area photographable. Being an Internet junkie, and not having wifi and cellphone service made it hard. There is cellphone service in the Yosemite village, and in a couple of restaurants, but you gotta be there to get it, not wandering around absorbing the sights. I opted to wander. My first day took me to the "Tunnel View". 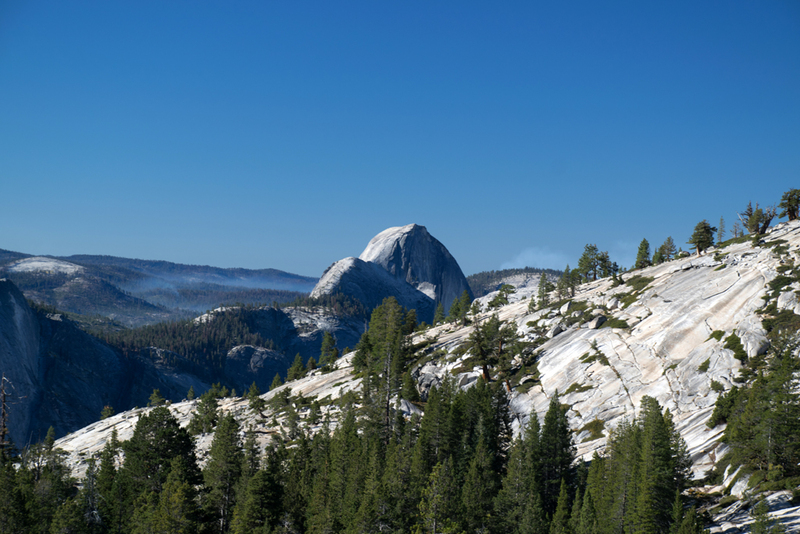 As can be seen, the air was heavy with smoke, but El Capitan and Half Dome were visible. Half Dome, Cathedral Peaks and Bridal Veil Falls. 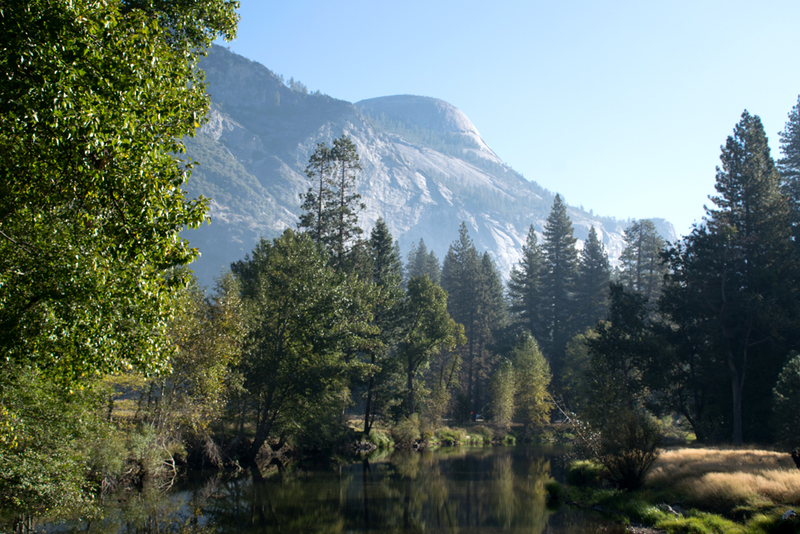 This is a view of El Capitan and the Merced River. 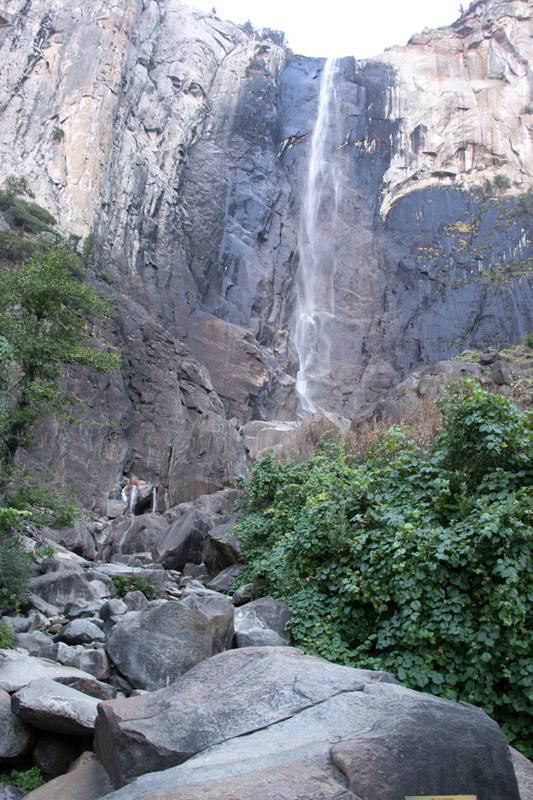 This is the 617-foot Bridal Veil Falls. This is a fantastic view when the water level is a full-flow and the water drifts out like a veil. That was not the case when I was there. 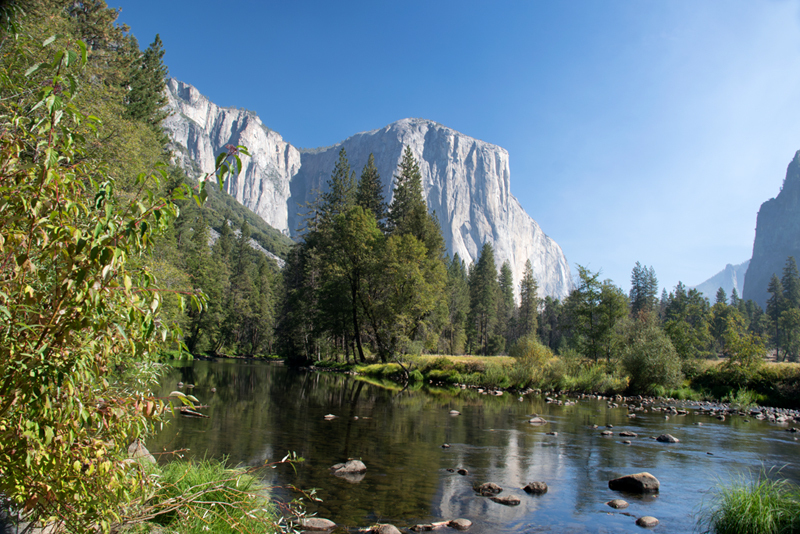 This is the 3000-foot face of El Capitan. If you look on the large version, you can see the contrails of an airplane. 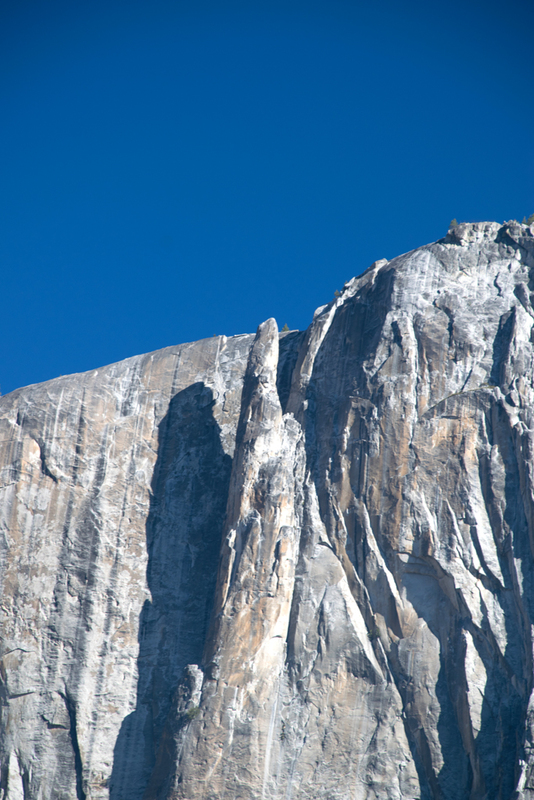 This is a composite of two segments I took of El Capitan that actually show climbers on the face. 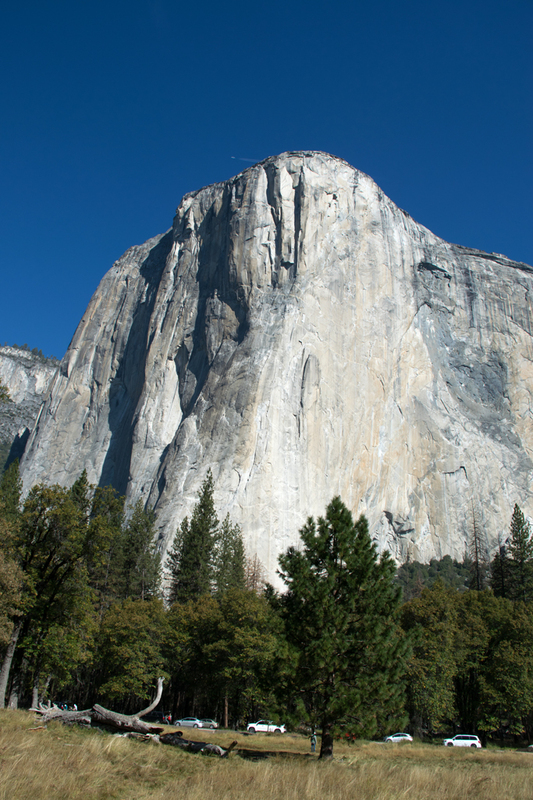 The rangers say that there are climbers on El Capitan every day of the year. Mother Nature has some exotic ways of cleansing the gene pool. 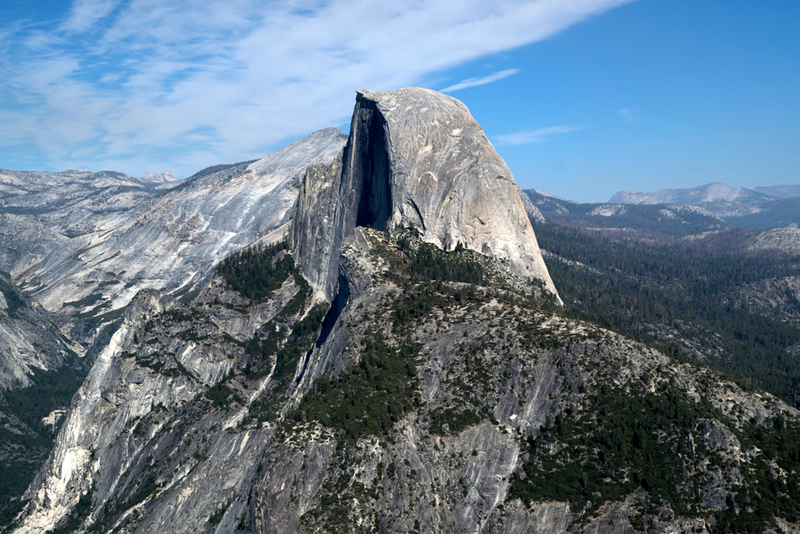 This is a shot of the 4737-foot Half Dome. It appears that the face of the formation has fallen off, but geologists say that is not the case. In any event it is impressive. 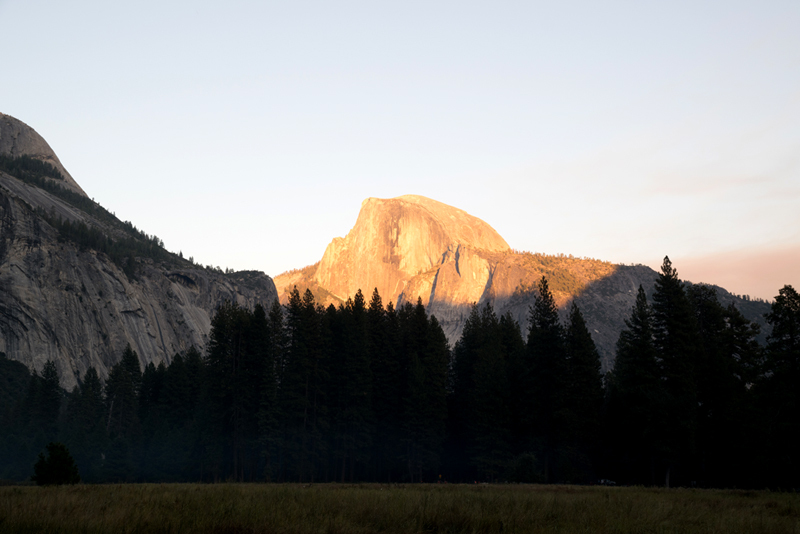 About an hour and a half later I took the same shot to show Half Dome illuminated by the setting sun. 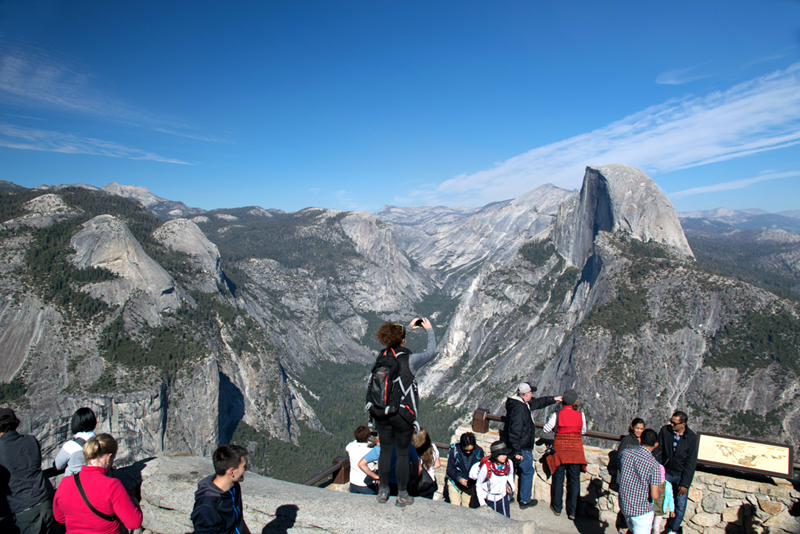 This is a view of Half Dome from the overlook on Glacier Point, which is 3200 feet above the valley floor. This is not the place for those with a fear of heights as the railings are right on the edge. Yikes! This is half Dome without the touristas. There was a park worker there that had a pair of high-power binoculars that allow you to actually see the climbers on the SW face of the rock. 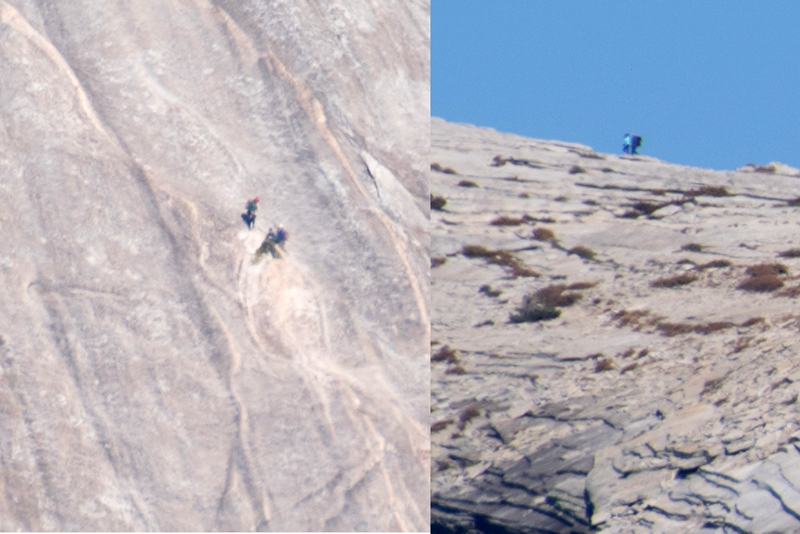 Not to be outdone, I got out my zoom lens and the result is this two-image extract of climbers on the side of Half Dome (on the left) and on the top of the dome (on the right). 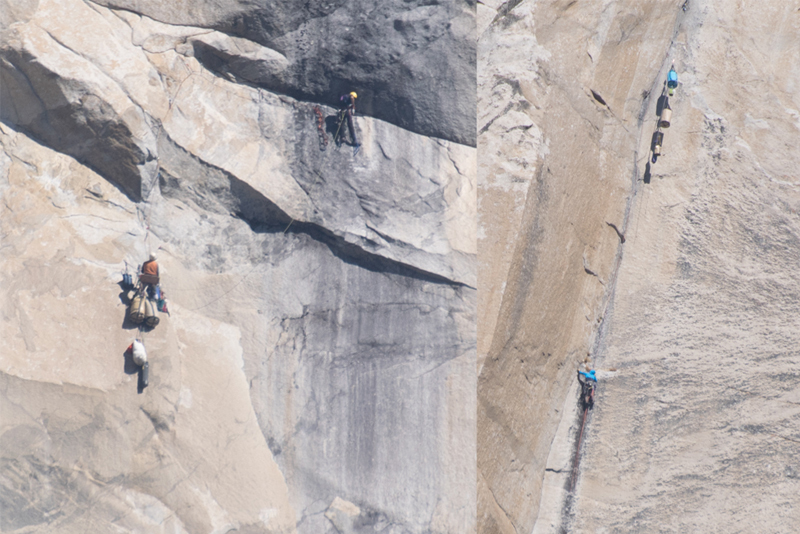 I call this "Half-wits on Half Dome"! 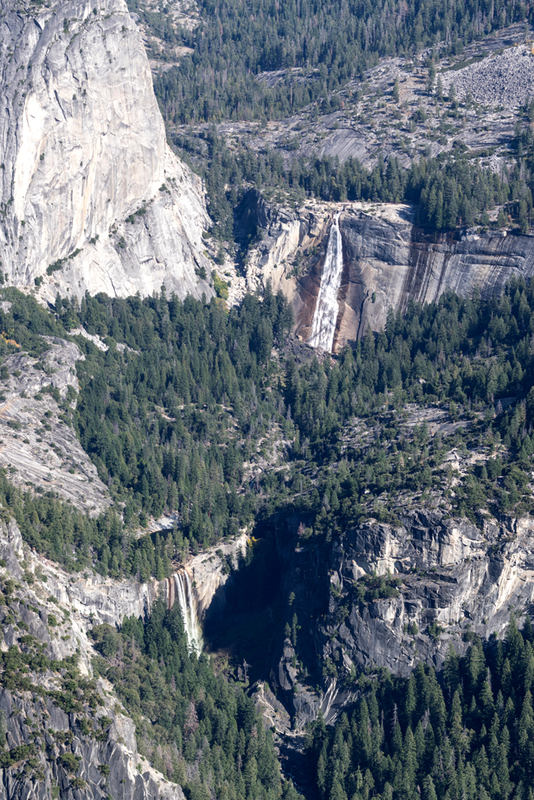 From Glacier Point you can see both the 317-foot Vernal Falls (lower falls) and the 181-foot Nevada Falls (upper falls). 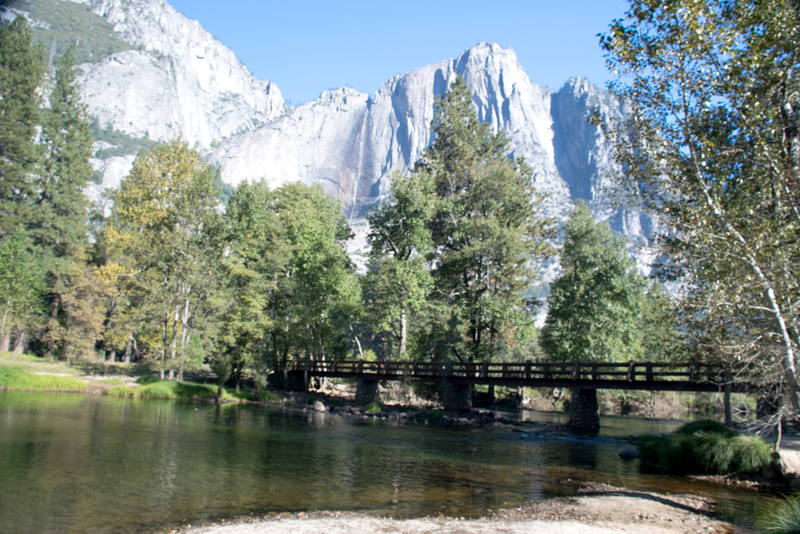 I was going try the 1.6 mile hike to a foot-bridge below Vernal Falls, but I was tired and my back was barking - not loudly, but barking. 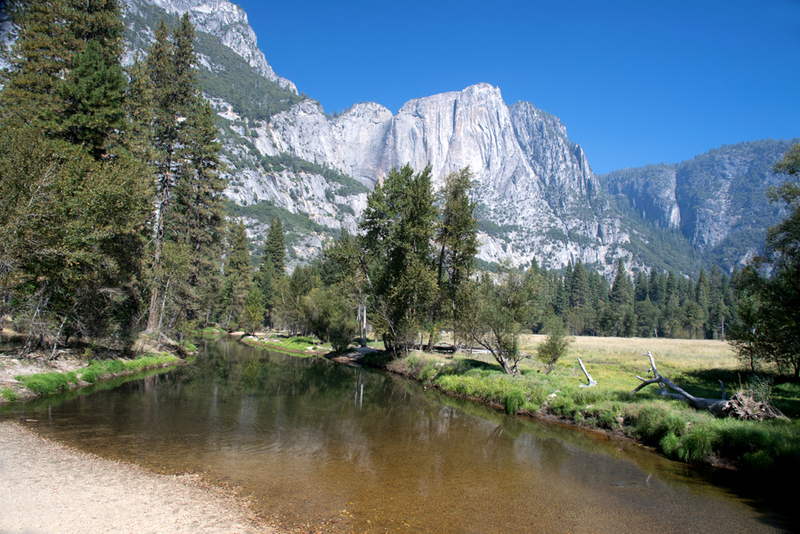 At various location along the valley floor, you can see both the upper and lower Yosemite Falls. 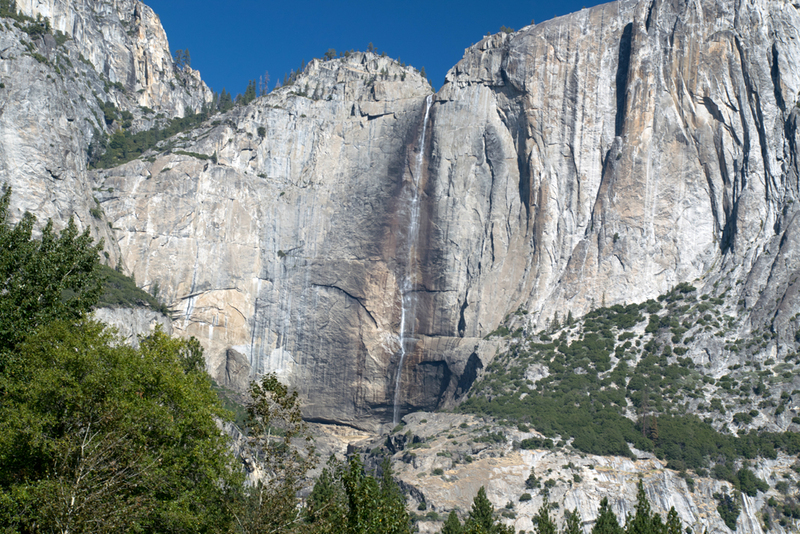 At a total of 2450 feet over three segments, it is the highest waterfall in the USA. This is a shot of the Upper Yosemite Fall. 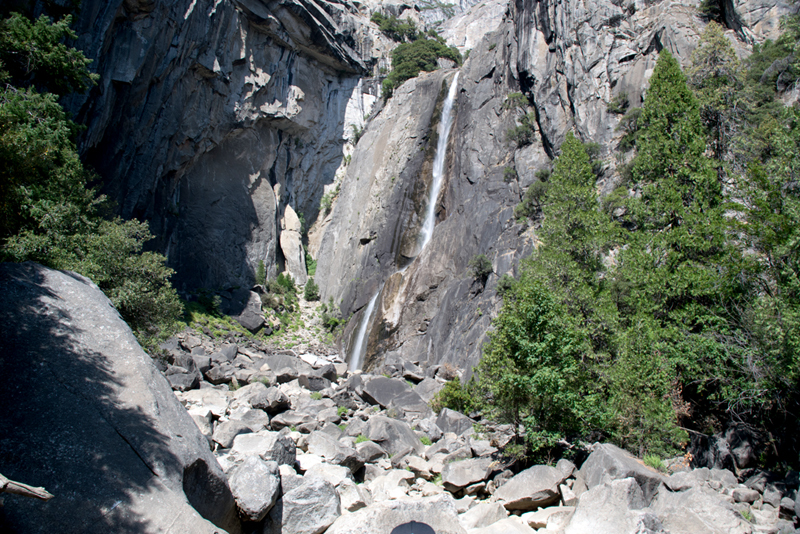 The upper falls has a drop of 1,430 feet. 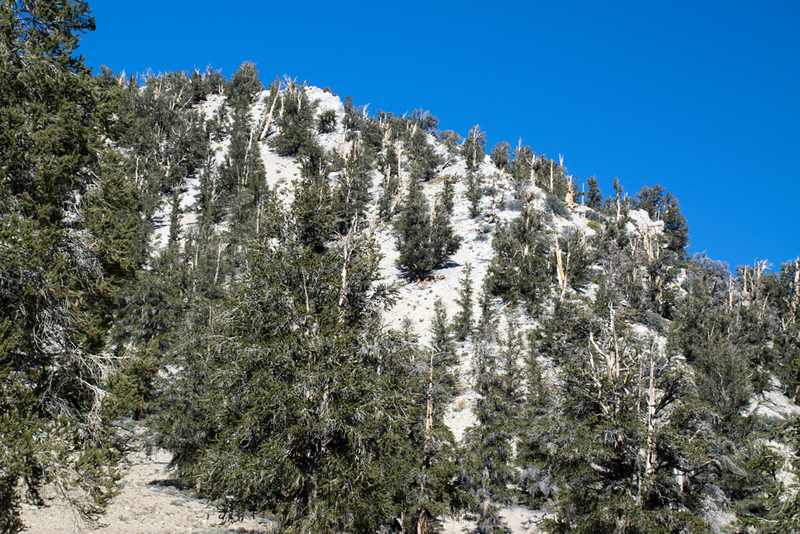 There is a 7.2 mile hike to the top that rises 2,300 feet and take 6-8 hours (for those so inclined). 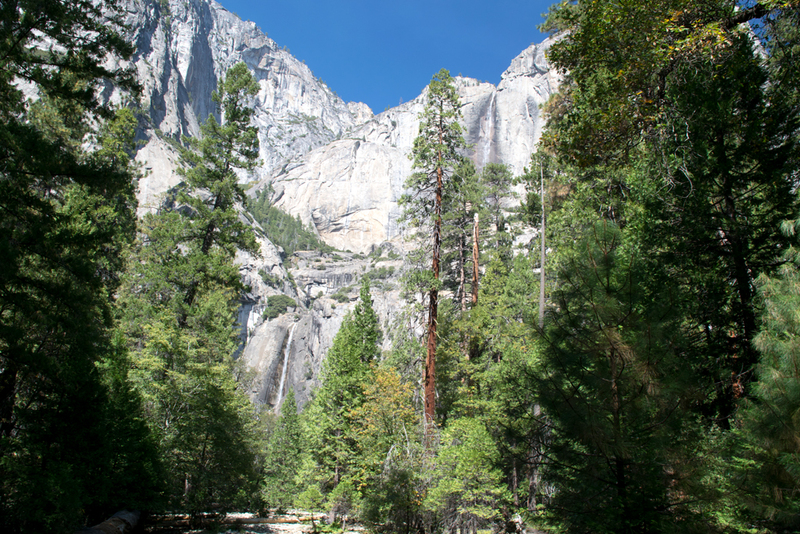 This is the lower Yosemite Falls which falls a mere 320 feet. This fall is easily accessible from the valley floor (which is why I got a photo!). 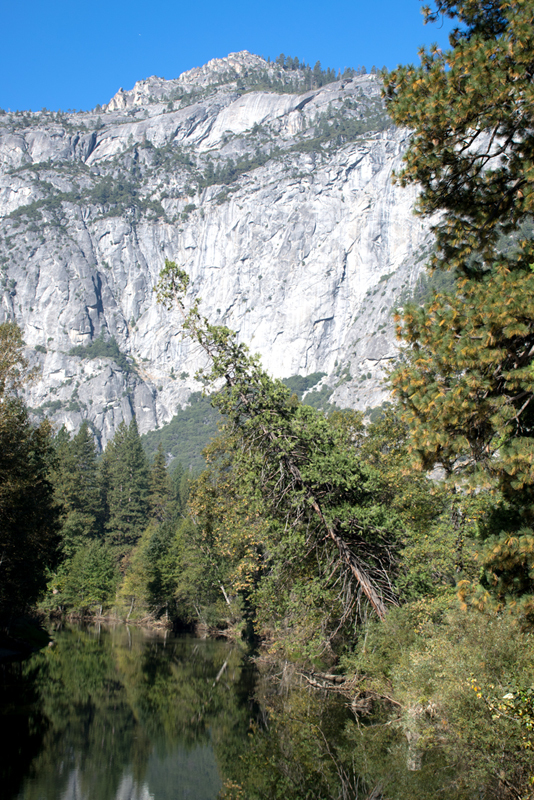 Not far from Yosemite Falls is this rock feature called the Lost Arrow. While the feature is neat by itself, I met a fellow tourist who has a photo of idiots crossing from the main rock-face to the arrow - on a tightrope! More idiots in my opinion. 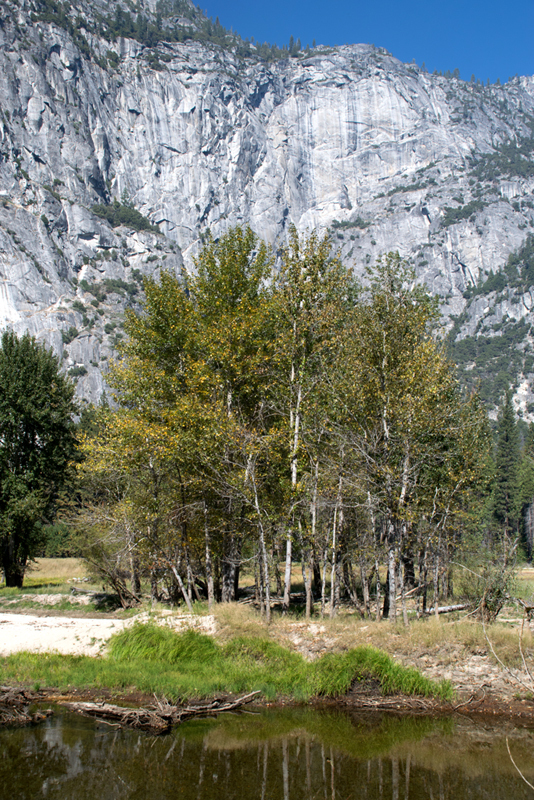 This is a panorama of two features of Yosemite Valley. On the left is a rock face called the Royal Arch, with the Washington Column atop it, and Half Dome on the right (behind Grizzly Peak). This is a composite of eight photos of the same scene shown above on row two. This is one of the most visited spots in the valley, and finding a parking spot is difficult. Even harder is getting the tourists to stop taking their "selfies" in the middle of the creek! Geez!. 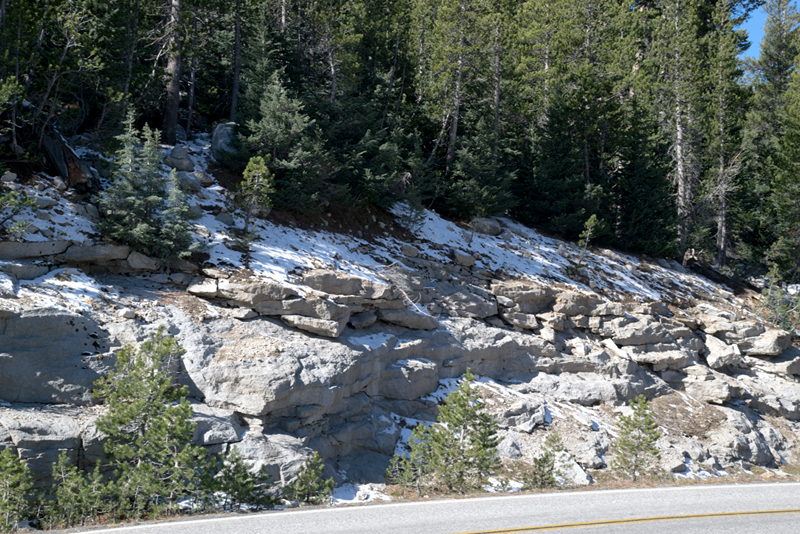 Tioga Road is the shortest route from Yosemite to Mono Lake. When I got to Yosemite, the road was closed because of snow. Thankfully, the snow melted the next day, so I was off the see Olmstead Point, Mono Lake and whatever came up along the way. 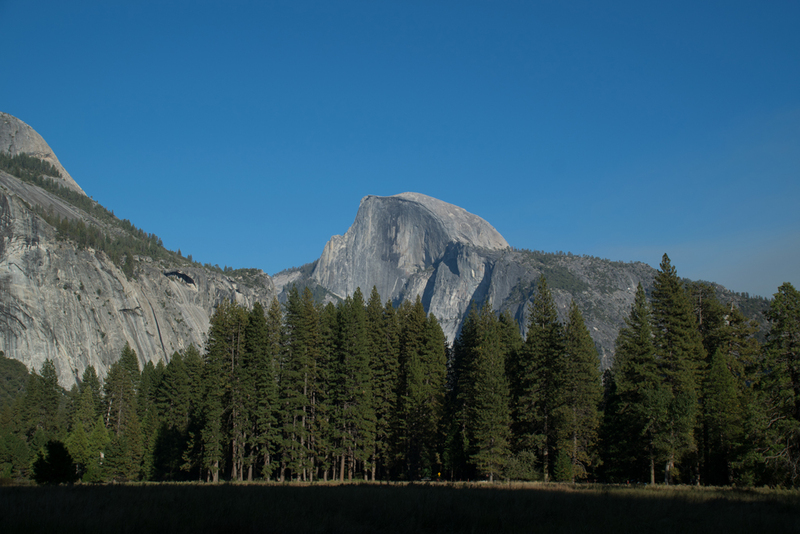 This is a shot of Half Dome from Olmsted Point (named for Frederick Law Olmsted). If you look carefully, you can see smoke in the valley to the left of the dome, and rising behind it to the right. I stopped along the way to take a snap of the remaining snow that had closed the road. A week after I got home the road was closed again. Along the road I spotted this tree (which I think is a young Sequoia) along the road. It just said "take my picture", so I did. 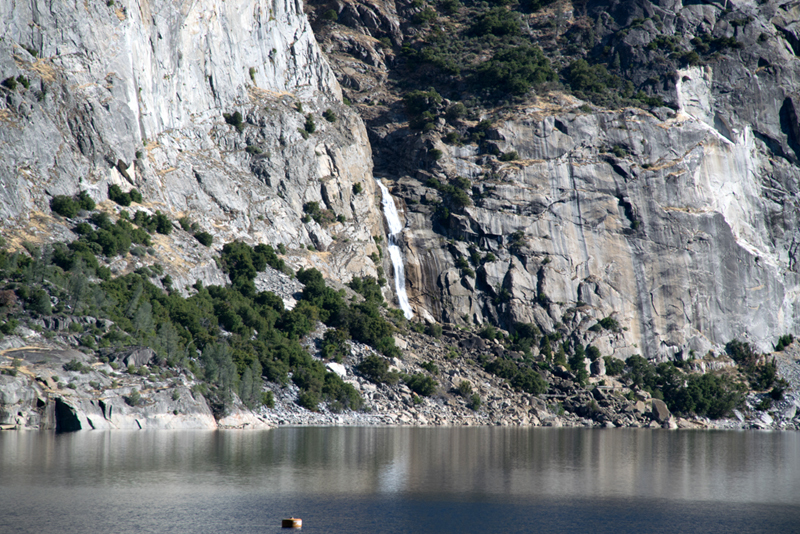 This is a panorama of Tenaya Lake, an alpine lake that sits along Tioga Road at 8,150 feet. The water is crystal clear, and the lake is full of trout. Too bad I did not have longer shoelaces or I would have gone fishing! 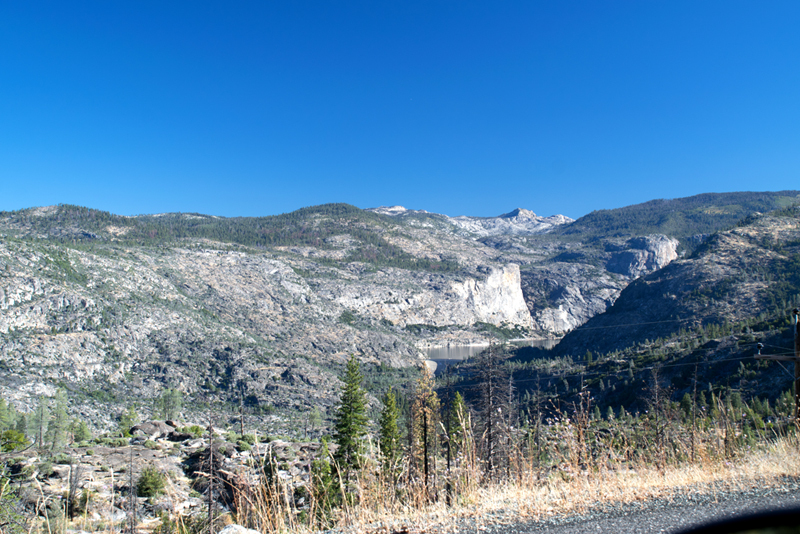 Stuck in the backwoods at the northwestern corner of Yosemite is the Hetch-Hetchy Valley. This area would still be wild and untouched, except for the San Francisco earthquake of 1906. Because of a lack of water to fight the fires, California petitioned the Interior Department to dam the Toulumne River and channel the water to San Francisco. After a seven-year battle, the Interior Department authorized the O'Shaughnessy Dam, thus ruining a wild and scenic area. 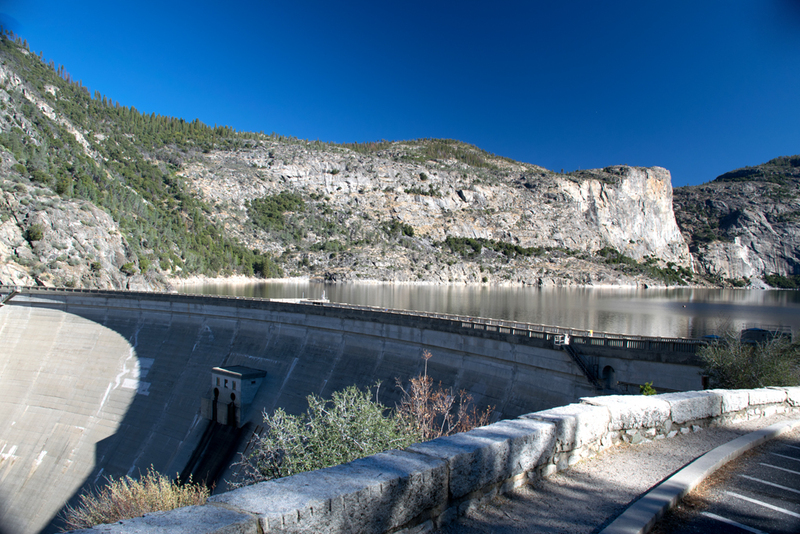 This is a shot at the top of the 430-foot dam, with the Hetch-Hetchy Reservoir behind it. In the background is Tueeulala Falls. This falls has a drop of over 800 feet, but only the last 280 feet is visible from the dam. While out in the wilds, I am always listening to the birds (and usually wondering where they are and what they are. While at the reservoir I heard a bird I recognized. 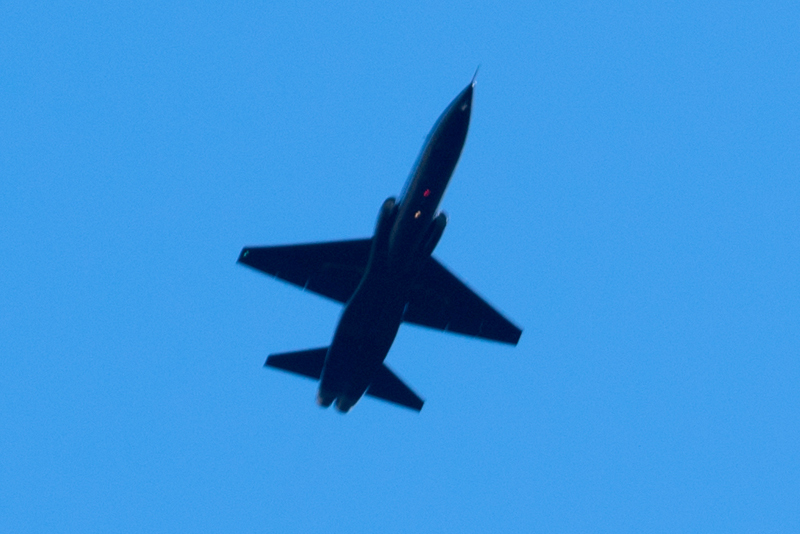 This is an F-14 Tomcat - I think. It zoomed by so fast I was lucky to get a shot. 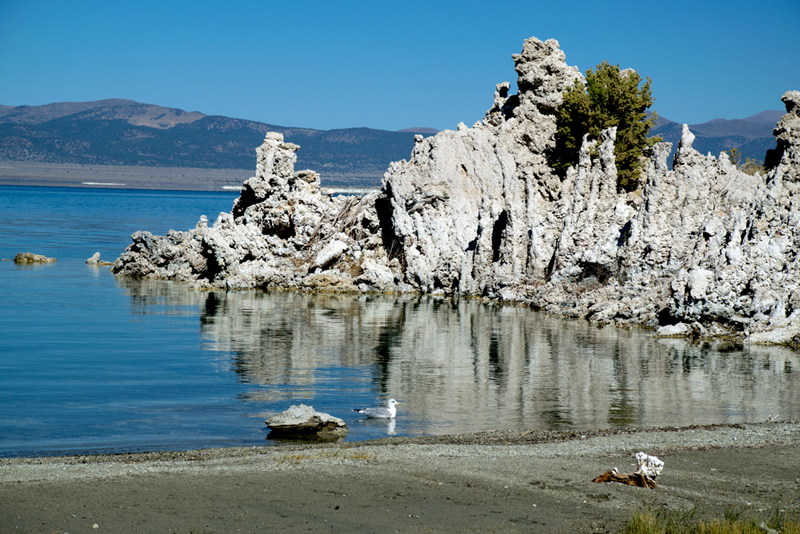 Mono Lake was on my list of places to see. A friend told me that I would be less than a man if I didn't see the Bristlecone Pines. So I did both - sort of. As you near the lake, you can see the Tufas. They are caused when carbonate minerals precipitate out of ambient temperature water (via springs) and form limestone formations. 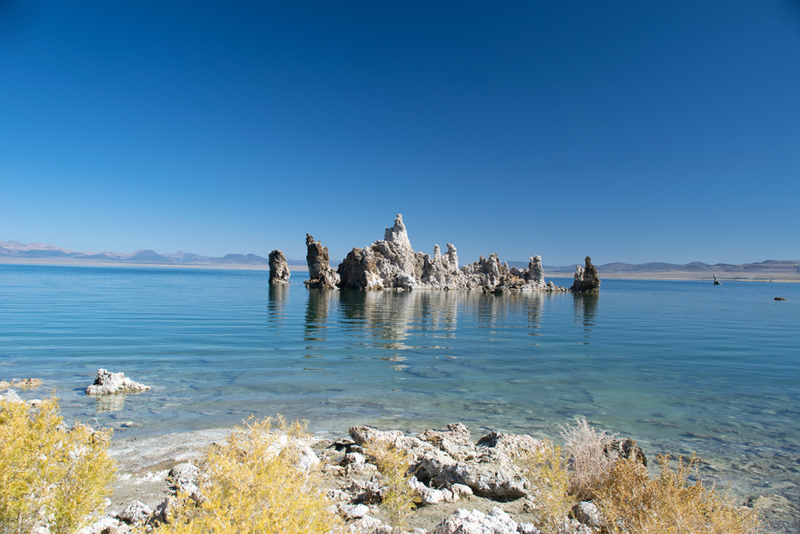 Along the shore you can see the Tufas, and the bird life that gathers to feed on brine shrimp that grow in the lake water. The Tufas cause some really strange, but photographic formations, both along the shore and in the water. The California Legislature has mandated that the water level be raised to a higher level. Based on what has happened so far, the water level mandated to be met in 1994 will be met in another 30 years. I was urged by a friend not to miss the Bristlecone Pines. 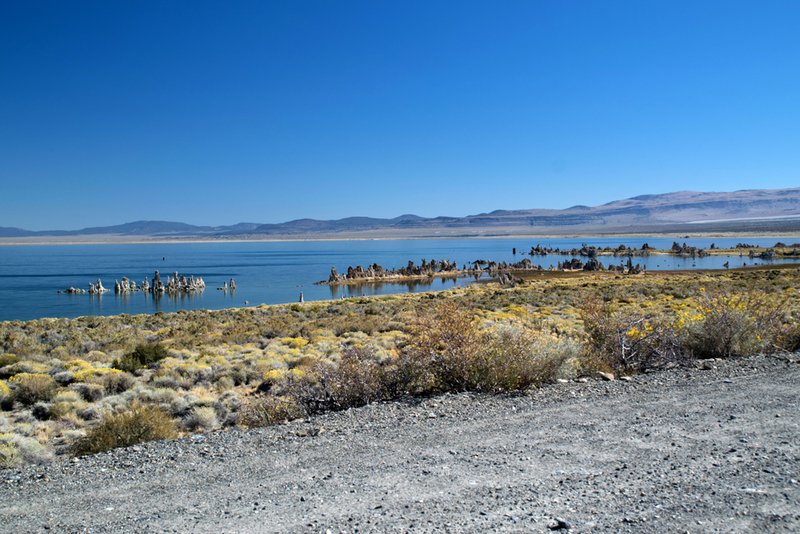 After inquiring at the Mono Lake visitor center and being told they were only "less than two hours away" I decided to make the drive, even though it was well after noon. After making the drive, missing a turn and almost driving to Nevada, I found the pines four hours later - just before the sun started going down. But I did get a shot or two, and really enjoyed the drive up the mountain road that climbed from 4,000 feet out side of Bishop, CA to over 10,00 feet at the park. All this on a road with no guard rails and hairpin turns and sheer dropoffs. What fun that would have been in the dark! I opted to miss that fun and left while it was still light. 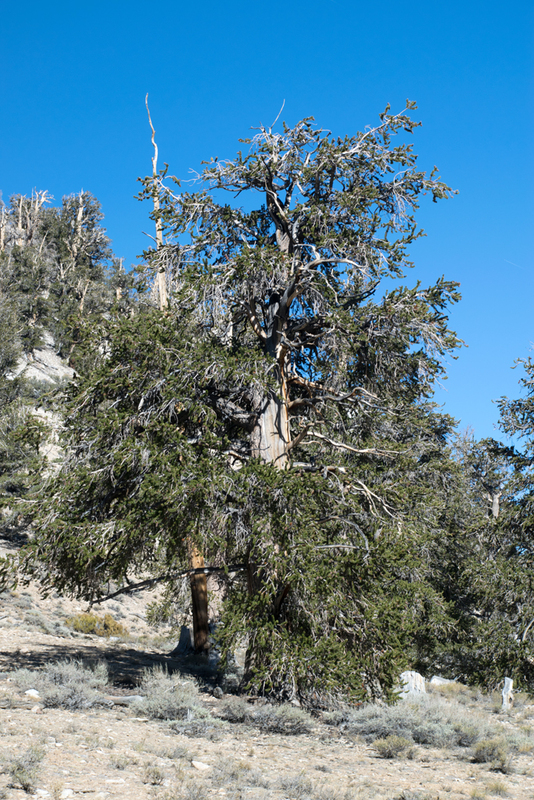 As you can see, these trees, which approach ages of over 5,000 years, grow in areas between 5,600 and 11,00 feet. These are on a hill at just over 10,000 feet in the White Mountain region of California. This is a sample. I wish I had had more time to explore the area. I always like to take "scenic" shots where ever I go. 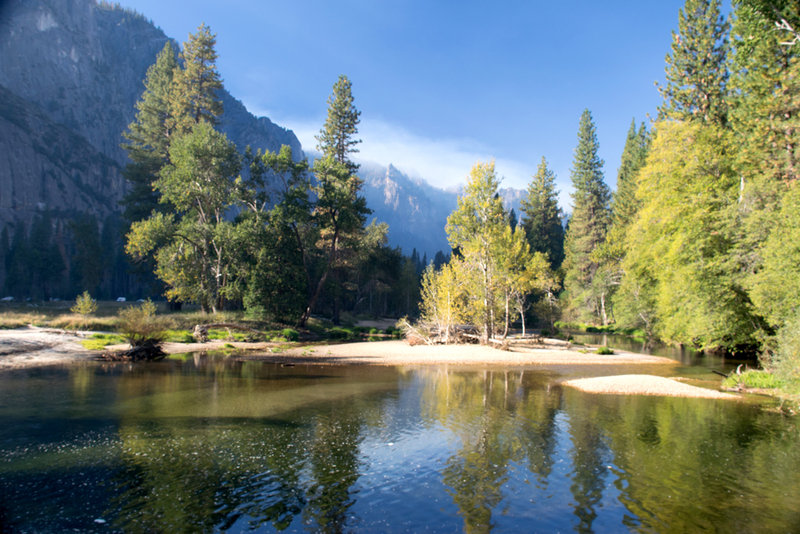 These are a series of shots along the Merced River in the Yosemite valley. 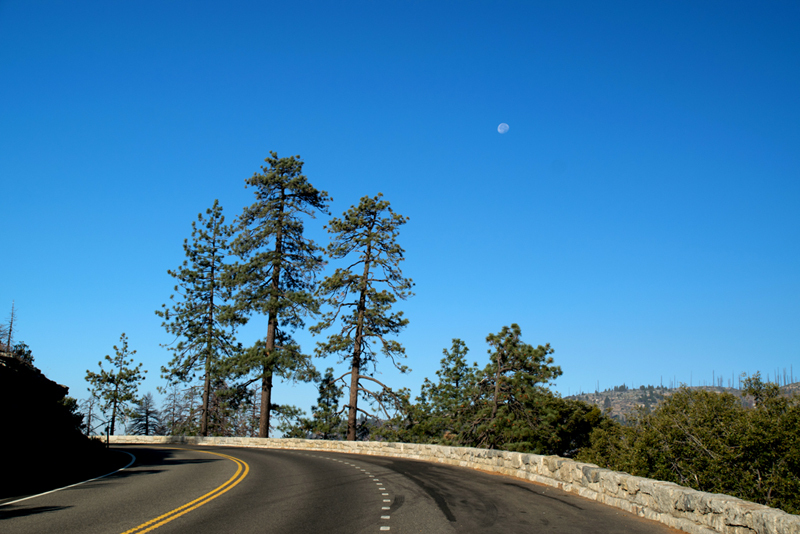 As I was leaving Yosemite for the LA area, I exited the Wawona Tunnel and was greeted with a nice view of the Moon and some trees. To show all of the beauty of this park, and all the others I visited, would be impossible. I spent 4 days in the areas around Yosemite. I would really like to visit in the late spring when the water coming over the falls is at its highest and the fires have not started. Also, another visit would allow me to see the Giant Redwoods in Mariposa Grove (which was closed for upgrades when I visited.) All I need is 6 numbers - the RIGHT six numbers! 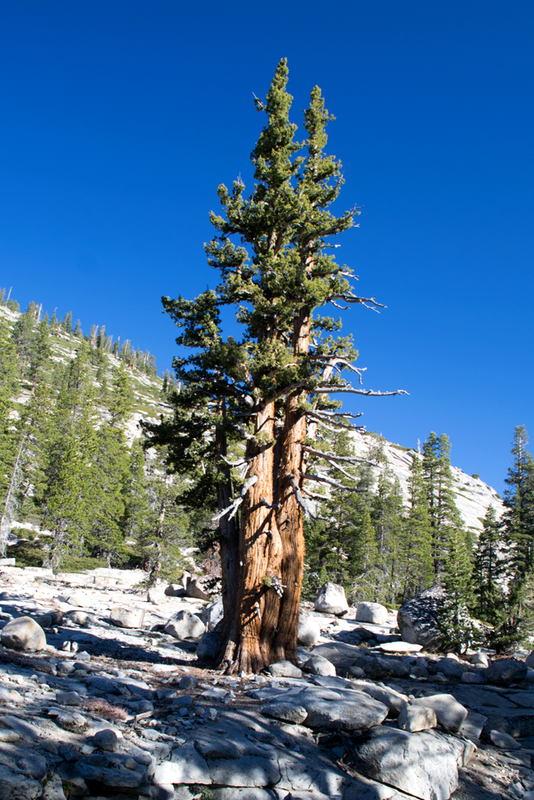 I would urge you to visit Yosemite National Park, and all the other places, like the Mariposa Grove, Mono Lake and of course, the Bristlecone Pines.